The proportion of teachers without a teaching licence in compulsory schools was 13-20% in 1998-2008. The proportion dropped after the financial crisis and was lowest in the autumn of 2012 at 4.1%. Since 2012 the proportion of teachers without a licence has increased year by year and was 12.4% of 5,311 teaching staff in the autumn of 2018. At that time there were 657 teachers teaching without a licence, an increase of 214 from the autumn of 2017. The proportion of teachers without a licence was lowest in the Northeast at 9.1%, and in Reykjavík, 9.3%. The highest rate of teachers without a licence was in the Westfjords, 27.7%. Small changes in the number of male teachers but more female teachers than 20 years ago Since the autumn of 1998 the number of educational personnel has increased from roughly 4,000 to over 5,300 in the autumn of 2018. Male teachers were nearly 1,100 in the autumn of 1998 but just over 900 in the autumn of 2018. At the same time the number of female teachers increased from almost 3,000 to just under 4,400. 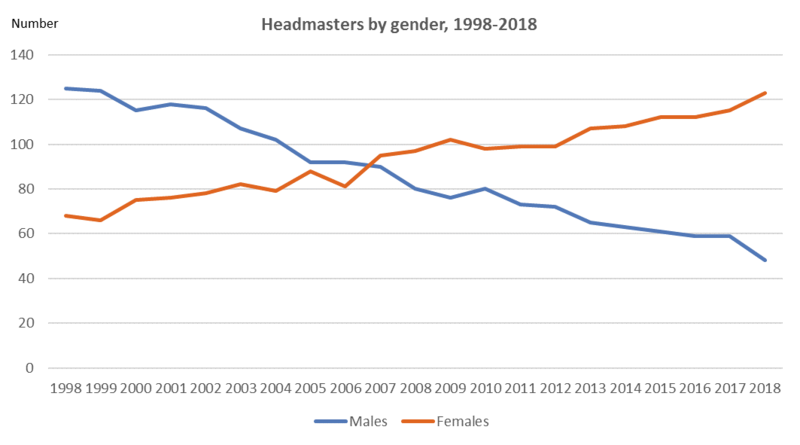 The number of male headmasters has decreased rapidly since 1998, from 125 to 48 in the autumn of 2018. At the same time the number of female headmasters has increased from 68 to 123. In the autumn of 2018 there were 8,473 staff members in compulsory schools in Iceland, 345 more than in the autumn of 2017 (4.2% increase). When looking back to 1998, when Statistics Iceland’s data collection on compulsory schools started, we see a considerable increase in the number of staff supporting pupils. The greatest increase is in the number of social pedagogues, from 29 to 213 in the autumn of 2018. The number of assisting staff increased from 247 to 1,161. The number of special education teachers and psychiatrists/student counsellors has more than doubled during the same period. When all personnel is considered there were 39.1% more staff members in compulsory schools in the autumn of 2018 than in 1998, but at the same time the number of students has increased by 8.2%. There have never been as many pupils in compulsory education in Iceland as in the autumn of 2018, 45,904. The number of pupils increased by 709 (1.6%) from the previous year. A total of 169 compulsory schools were operating in Iceland in the autumn of 2018, the same number as in the previous year. There were 13 private schools operating with a little more than 1,100 pupils, one more than in the previous school year. There were three special education schools operating with 163 pupils in attendance, a slight decrease from the previous year. The largest compulsory schools in the 2018-2019 school year were located in municipalities close to Reykjavík. They were Varmárskóli and Hörðuvallaskóli with more than 900 pupils, and Hraunvallaskóli with almost 800 pupils. The smallest school was Grímseyjarskóli with three pupils in the autumn of 2018. The number of pupils with a foreign mother tongue has increased year by year since Statistics Iceland started collecting these data. In the autumn of 2018, 4,874 pupils in Icelandic compulsory schools had a foreign mother tongue, or 10.6% of pupils, an increase of more than 400 pupils from the previous year. It should be pointed out that some of these pupils also speak Icelandic as their mother tongue. The most common foreign mother tongue was Polish, spoken by more than 1,700 pupils, almost 350 spoke Philippine languages, and more than two hundred spoke English, Lithuanian or Thai. The number of pupils with foreign citizenship also increased from 2017 and was more than 2,500 in the autumn of 2018.